I’ve heard of people going off to college not knowing what they want to major in but when it comes to actors, Chris Judge takes the cake. He was awarded a football scholarship from the University of Oregon where he started off as a pre-med major. The math was hard so he changed to psychology. Not satisfied, he switched again to telecommunications and film. Chris entered a competition and won a spot to host a local radio show. With added confidence he entered another competition. He wrote a five minute dialogue for a second competition that landed him as host on a local FOX morning show. From radio to TV hosting Chris was still playing football and his team earned their way to the Hula Bowl his senior year. After College Chris Judge moved to LA and studied at the Howard Fine Studio. He landed roles on MacGyver and a few other projects including Bird on a Wire. According to his biography, Chris Judge was hanging out at friend’s house when he overheard a roommate practicing for an audition. It was for a new show called Stargate SG-1. This peaked Chris’ interest. He snuck into the room and got the contact information for the audition. Chris called his agent and demanded to get a chance to audition. Chris said the Teal’c character had more people audition than any other role. The rest is history. Over 200 episodes of “Stargate” later and Chris is still involved with TV, movies, and voice acting as well as writing. During Fantasy Con my 8 year old son walked up to Chris to say,” Hi”. With a press pass I didn’t want to seem imposing or take time away from Chris’ other fans. I wasn’t prepared for the kindness Chris showed my son and his siblings. Sure, he smiled and shook their hands but he also asked about their schooling and showed interest in my kid’s questions. He took them aside and squatted down to their level to talk. You can tell he honestly loved children. 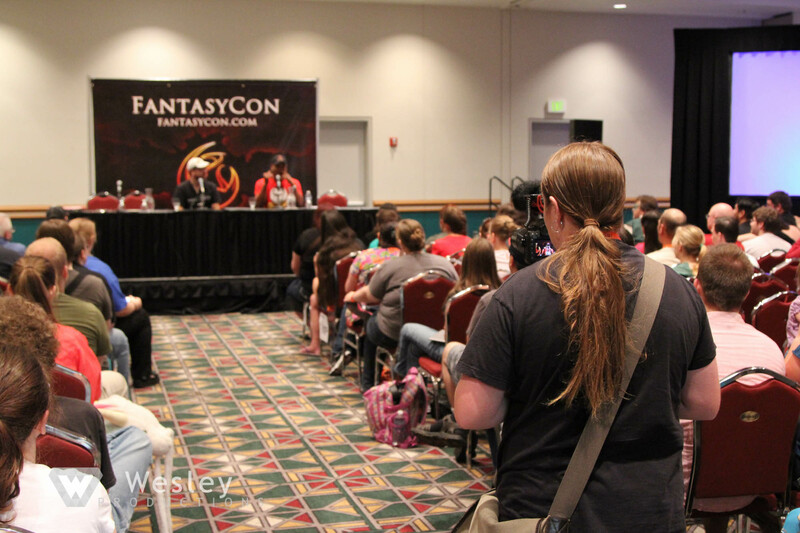 The next day Wesley Productions was invited to Chris’ panel. It was one of the best panels at the convention. Chris really knows how to engage an audience and loves his fans. He discusses being on set, practical jokes, getting into trouble by the studio from passing gas, getting hurt on set, and enjoying his craft. Note, Chris is quite candid and honest during the panel. Although Wesley Productions took liberty to edit out parts of the interview, the content might not be suited for all audiences. Chris discusses school house rock cell phones, stealing set pieces, flagalance, codpieces, Christian Bale, getting hurt on set, Inception 2, and even getting reprimanded by MGM for farting too much on set. He also talks about supporting the art programs in schools. This was filmed by Katie Wesley who asked the “sock color” question that Chris made fun of. As an antidote, Katie approached Chris after the panel and re-asked the “sock color” question. Chris laughed, thanked Katie for being such a good sport and told her that purple or maybe a sea green are among his favorites.